Ronald Charles Cey (/ˈseɪ/; born February 15, 1948) is an American former professional baseball player, a third baseman in the major leagues. He played for the Los Angeles Dodgers (1971–82), Chicago Cubs (1983–86), and Oakland Athletics (1987). Cey batted and threw right-handed; a popular player, he was nicknamed "The Penguin" for his slow waddling running gait by his college coach, Chuck "Bobo" Brayton. Born and raised in Tacoma, Washington, Cey was a multi-sport athlete at Mount Tahoma High School, its first to earn nine varsity letters. Following graduation in 1966, he attended Washington State University in Pullman and was a member of Phi Delta Theta fraternity. Cey played two years of college baseball for the Cougars, on the freshman team in 1967, and a year on the varsity under head coach Brayton in 1968. He was selected in the second phase of the 1968 MLB draft in June. With the Dodgers, third baseman Cey was part of an All-Star infield that included Steve Garvey (first baseman), Davey Lopes (second baseman) and Bill Russell (shortstop). This quartet was the most enduring infield in baseball history. The four infielders stayed together as the Dodgers' starters for eight and a half years. Cey was one of the most productive and adept-fielding National League third basemen in the 1970s, but was overshadowed by Pete Rose and Mike Schmidt. 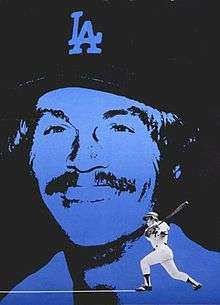 In 1977, he was named NL Player of the Month in April after helping the Dodgers to a fast start by batting .425 with 9 home runs and a ML record 29 RBIs for the month of April. The Dodgers won the Western Division title that season on their way to the National League pennant. Cey continued to have productive seasons with the Dodgers, helping them to pennants in 1978 and 1981. After the 1982 season, the Dodgers traded Cey to the Chicago Cubs for two minor leaguers so that Pedro Guerrero could move to third base and rookie Mike Marshall could get in the Dodgers' outfield. Cey provided veteran leadership for the Cubs over four seasons and, in 1984, helped lead the Cubs to the National League East Division title, hitting 25 homers and driving in 97 runs, both team highs. Cey spent the final year of his career in 1987 as a part-time player with the Oakland A's. Cey played in the 1981 World Series, helping the Dodgers to four straight victories after losing their first two games, including his return for the clinching Game 6 after being hit in the head by a wild Goose Gossage fastball, and helped off the field in Game 5. Cey was named co-MVP along with Steve Yeager and Pedro Guerrero, and won the annual Babe Ruth Award. He is still a part of the Dodgers organization and continues to make appearances on the team's behalf. 1 2 Bolton, Barry (March 24, 2010). "Ron Cey sets record straight on 'The Penguin'". Coug Fan. Retrieved September 25, 2014. 1 2 3 "Flashback: Ron Cey, Mount Tahoma, Class of 1966". Seattle Times. May 11, 2004. Retrieved September 25, 2014. ↑ "Washington State University Baseball Players Who Made It to the Major Leagues". Baseball-Almanac.com. Archived from the original on 16 December 2012. Retrieved 16 December 2012. ↑ "Draft tabs Pac-8 stars". Spokane Daily Chronicle. June 8, 1968. p. 8.